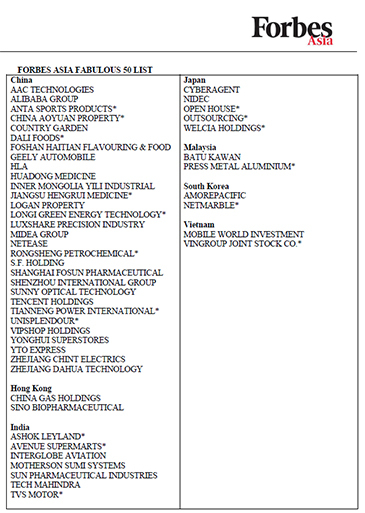 SINGAPORE (Sept. 6, 2018) — Companies from China once again dominate Forbes Asia’s Fabulous 50 List of the 50 best publicly traded big companies in the Asia-Pacific region with a record 30 listees. The list also features 17 new entrants. The full list can be found at www.forbes.com/fab50 and in the latest issue of Forbes Asia, available on newsstands now. The “Fab 50” companies are selected from a pool of 1,744 public companies in the region with at least US$2 billion in annual revenue and have been listed for at least a year. Loss-making companies or those with less revenue than they had five years ago do not qualify. The list also excludes companies that have a high debt ratio, are more than 50% state-owned or more than 50%-owned by listed parents. Companies are then analyzed according to more than a dozen financial measures. The goal is to highlight well-run entrepreneurial outfits, an honor roll of high-performing blue chips, the region’s best of the best..
Once again, the two most valuable companies on the list are Tencent and Alibaba. The Chinese Internet giants boast vastly greater market capitalizations and enjoy far higher profits than any of the other companies on the list. Tencent’s net profit soared 71% last year to $10.6 billion, while Alibaba’s climbed 49% to $9.7 billion. Tencent, which appears on the Fabulous 50 list for the tenth straight year, has been investing in startups to hatch new services for its core business. It is casting a wide net in sectors such as video game broadcasting, financial services and online shopping. It usually begins with a 10% to 20% stake in either early-stage startups or more mature outfits. One example is how Tencent’s WeChat app is getting a boost from the company’s investment in the budget-shopping service Pinduoduo, or PDD. Nasdaq-listed PDD operates under a group-buying model, tapping WeChat’s 3 million active users across the social media platform to form purchase groups and get more discounts. This, in turn, has led to more frequent usage of WeChat’s payment function as users pay for PDD purchases with the app. Tencent is also reaping huge rewards when it cashes in its investments. At the time of those exits, Tencent’s stakes in the companies, such as China Literature and the gaming platform Sea, were worth more than $20 billion. Similarly, Alibaba which makes its third appearance, has invested in startups and taken part in deals focused on retail and e-commerce. The Hangzhou company is also more involved in the startups it invests in, sometimes with the goal of eventually acquiring them. Aluminum producer Press Metal makes its debut on the list with a market capitalization of $4.7 billion. The Malaysian company, started by CEO Koon Poh Keong and his six brothers, generated $2 billion in annual revenue with a net profit of $138 million last year. 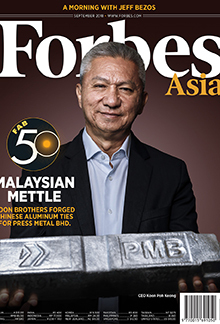 Since investing a total of $1.2 billion in its two aluminum smelting plants in Sarawak, Press Metal has a capacity of 760,000 tons a year, the largest in Southeast Asia. Koon is also featured on the cover of the latest issue of Forbes Asia. Indian retailer Avenue Supermarts breaks into the Fab 50 this year following its listing in March last year. It saw a 31% increase in revenue and a 75% jump in net profit over its previous fiscal year. It is one of the world’s most valuable hypermarket companies and its market capitalization rose to $14.1 billion as investors bid up its stock by 66% in the past year. Avenue runs supermarket chain DMart, which sells everything from groceries and apparel to toys and games and generated $2.3 billion in revenue for the year ended March 31. Other notable newcomers on this year’s list include Anta Sports Products, the first Chinese sportswear company to reach 10 billion yuan in annual sales. Started in 1991 as a shoemaker, the Fujian company now boasts 11,316 stores across China, its revenue split between footwear and apparel. Netmarble, South Korea’s largest gaming company, also made the list for the first time as its net profit jumped 83% last year to nearly $275 million. Vingroup Joint Stock Co., a Hanoi conglomerate started by Vietnam’s first billionaire, Pham Nhat Vuong, also debuted with a market capitalization of $14.1 billion. The property developer builds high-end townships and luxury resorts and hotels, and recently launched Vinfast, an automaker. Capitalist churn also saw four regular listees unable to make the cut this year - India’s HDFC Bank, South Korea’s Naver, China’s Baidu and Great Wall Motor.